· A combination of molecular and morphological data has shown that eastern and western forms of the bat previously known as Myotis daubentonii each deserve specific status, and may not be sister taxa (Matveev et al., 2005). The eastern form, now known as M. petax, has been found in Mongolia and Manchuria. The name 'eastern Daubenton's bat' is inappropriate and transitional, and is not a good descriptor if the species is not sister to M. daubentonii. · Fur brown, whitish ventrally. The ears appear more rounded than in M. laniger. · Two males caught at Sihe and Shidu, about 100 km SW of Beijing, had forearm lengths of 36.7mm (juvenile) and 40.8mm (adult). Matveev et al. (2005) give forearm length as 37.16 + 1.1 mm, hind foot length 8.24 + 0.6 mm. · M. petax has distinctive skull and dental morphology compared with M. daubentonii: it has shorter upper and lower toothrows, and is smaller in other cranial features, The paraconule and the paraloph of the third upper molar are well defined in M. petax, and are often missing in M. daubentonii (Matveev et al. 2005). ·M. petax has a larger baculum than M. daubentonii (almost twice as large) and the baculum does not narrow at the tip (Matveev et al. 2005). East of the Omsk region in Russia. Recorded from Russia, Japan, Kazakhstan also (Matveev et al. 2005). Distribution below (using record of M. daubentonii from Zhang et al. (1997), withour new record in red. 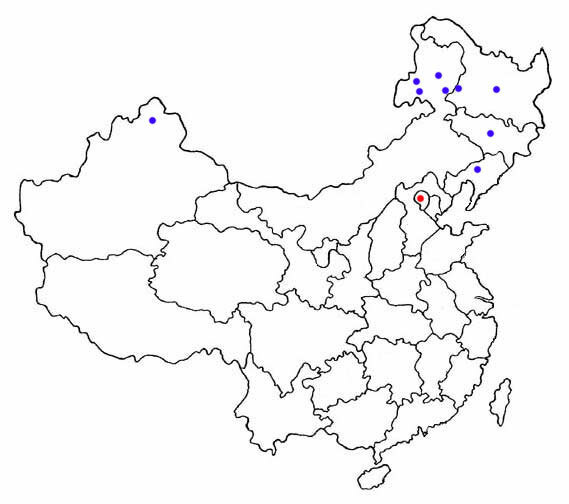 The Chinese distribution is shown by dots on themap (as given by Zhang et al ., 1997 and Wang, 2003). Originally Wang (2003) referred to 3-4 subspecies and/or forms of Myotis daubentonii distributed in China . However, Matveev et al . 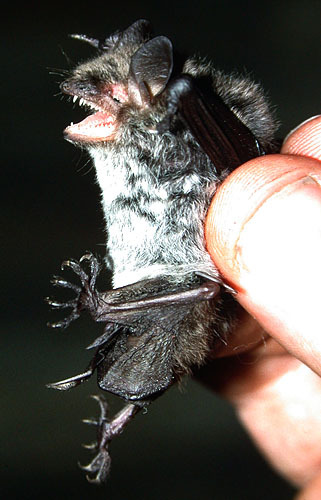 (2005) suggested that Myotis petax (described from Chuiskaya Steppe, in Altai, south of western Siberia, and north of Xinjiang Province) must be accepted as valid for what was formerly known as the ‘eastern complex of forms of M. daubentonii '. Herein, we map northern Xinjiang and northeastern China as the distribution of this species. In South China , it should be Myotis laniger , now referred as a full species separated from M. daubentonii. · Little known. Large feet suggest they capture food by trawling. In Altai, Russia, bats of this species were observed flying above a meadow or in a birch grove at 2-6 m above ground. also flies over water (Matveev et al. 2005). · Roosts in caves. In Beijing, we trapped some individuals by mist net in front of the entrance of a limestone cave, near Darwin Centre for Bat Research and Conservation. The surroundings include agricultural lands, village houses, a reservoir as well as secondary forests in mountainous areas (altitude approximately 710 metres). · Loudest on a bat detector at 47-48 kHz (Matveev et al. 2005). · Caves, and water bodies should be protected as their habitats.